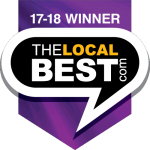 Voted #1 Burger in Sioux Falls six years straight! 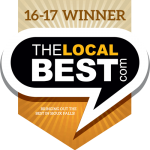 Voted #1 Burger in Sioux Falls five years straight! Burgers, fries and local brews—really, what could be better? 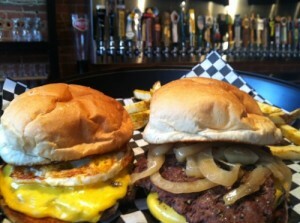 All three can be found at JL Beers on Phillips Avenue, an uptown spin on the classic burger joint. Though small in square footage (waiting is a given on weekends), JL Beers is big on authentic flavor. Pro tip: with alcoholic beverages taking center stage, only those 21 and up are allowed entry, sorry underclassmen. That wide selection of beverages alone is worth navigating the downtown parking scene for a trip to JL Beers. With a rotating menu of tap, bottled and “beertail” offerings, it’s hard to know where to begin when ordering a drink. But that’s a good problem to have. The restaurant also boasts a selection of beer flights if you’re in the mood to try a cadre of flavors, sweeter ales and mixed brews. And for the traditionalist, anything from Miller Lite to Budweiser is permanently on tap. Beer may be the star of the JL Beers show, but burgers are what give the restaurant its staying power. Though not as wide-ranging as the drink list, the burger offerings are sure to satisfy any beef aficionado. Start with the classics—the original hamburger stand burger, the great American cheeseburger or the classic burger—and move on to more adventurous fare with the rajun cajun, Mt. Mushmore or the commander in beef. No one burger tops $7, and most are under $5. JL Beers also offers chicken sandwiches, and any hamburger patty can be substituted for a black bean burger with wild rice and quinoa for 99 cents. Oh, and don’t forget about the fries. Cut and fried in-house using cholesterol-free soybean oil, you can’t go wrong with a simple sea salt seasoning for $3.19. Cajun, cheddar, BBQ and parmesan garlic seasonings are also available for the same price, while buffalo BLU, BLT BLU and loaded fries will set you back into the $5 range. A more city-center bar than traditional burger stand, the interior of JL Beers is a haven of high-top tables, big screen TVs and baskets upon baskets of burgers. The food comes quickly, but as previously mentioned, the wait to get a table might not. As the restaurant’s tagline says: “seating for 1,000 … 47 at a time.” If you’re in the 47 you’re one of the lucky ones. If not, it might be 47 more minutes before you taste that mouth-watering bovine patty. On the upside, there’s no table required to order a drink. So pop a squat and chat with your pals, otherwise heading back on a weeknight is always an option, as the restaurant is open daily from 11 a.m. to midnight. JL Beers isn’t just your typical sports bar. It’s quirkier than that. The downtown high-low vibe continues once you step inside the restaurant’s door. Adorned with exposed brick and old-fashioned brewing paraphernalia, the bar dominates the majority of the space. As it should. But so does a painting of a medieval knight conquering a keg and a display where you can send postcards asking friends to buy you a beer in German. It’s these hints of self-deprecation that show JL Beers is in on the joke, inviting patrons to laugh along. So what’s better than beer, fries and local brews? Maybe an evening spent at JL Beers, with a postcard to prove it. 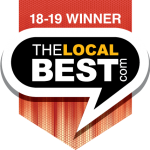 Voted #1 Burger in Sioux Falls four years straight! Voted #1 Burger in Sioux Falls three years in a row! Voted #1 Burger in Sioux Falls two years in a row! A sign inside JL Beers says it best: “Seating 1,000 people a day 47 at a time.” Yes, JL Beers is small. 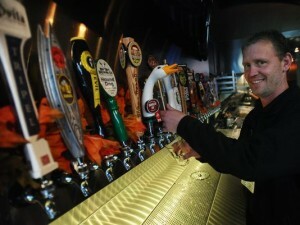 But general manager Brian Wilson promises the downtown bar is big on everything else. “We are big on burgers, big on beer and big on service,” he says. Not sure what to choose? Wilson recommends beer flights — five 5-ounce brews ranging in price from $9 to $10.75. To make sure the word gets out about the restaurant, diners can send Beermail — postcards from JL Beers. Question: How did JL Beers get its name? Answer: We are a beer-obsessed chain, so JL Beers stands for “Just Lots of Beers.” No, really it is named after Fargo businessman Jim Lauerman. Q: What is something most people don’t know about JL Beers? A: It is a franchise that began in Fargo in 2009. There are now eight JL Beers in the country. Q: Why is it so important to have information about each beer on your menu? A: It gives the customer the idea of the flavor profile of the beer and the amount of alcohol. Q: How big is social media to get the word out? A: It is one of our primary marketing tools. Of course, there is Twitter and Facebook, but our text club is unique. We can send out features and promotions and updates on new beers. Text JLBEERS323 to 46786 to join. This is why Sioux Falls is the Best Little City in America. Forget Five Guys. Everyone in Sufu knows JL Beers is the place to go for burgers on a budget. You can add as many extras (including patties) as you want, so some locals come to reenact Man Vs. Food style challenges. 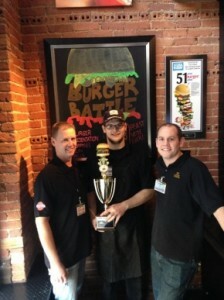 JL Beers is the winner of the first Downtown Burger Battle. Featured burgers from seven restaurants vied for the title. Diners rated them in five categories: burger, presentation, toppings, bun and value. JL Beers logged the highest average points for the restaurant’s Humpty Dumpty Burger, which includes a hamburger patty, cheese and a fried egg. More than 1,600 rating slips were submitted by the seven participating restaurants during the promotion. Voted #1 Burger in Sioux Falls! Burgers and beer. Not a lot of American traditions trump that.1 Nowadays you can go anywhere for a burger and a beer. You could just stay at home, make a decent patty, and get a 12-pack to share with your friends. I’m here to tell you, though, that if you forego the restaurant route, you’re missing out on the newest gem to hit Sioux Falls. When you get a seat, be prepared for nothing short of amazing. I highly suggest ordering a “Flight of Beer.” You get five sample sizes of different brews within different categories to test and grade. The beers come on a wooden plank in order so you can order more of whichever kind you like. I tried the Seasonal Flight and the Midwest Flight, and both were phenomenal.8 Granted, there were beers on these flights that I could hardly stomach and only sipped, but I still appreciated the taste and knowledge of what I prefer versus what I’m not a fan of. To compliment my beer flight, I ordered a few of their most popular menu items. First, I ordered the Best Beer Cheese Dip Ever9 with a side of their fresh-cut chips. Each of the items lived up to its name. The fresh cut chips are literally cut in a machine that takes an entire potato and spiral-cuts it to make giant, crispy chips. The beer cheese dip is served nice and warm, and was delicious on the chips, the fries, and the burger.10 I’m not sure there is much of anything that it wouldn’t taste great on. My burger arrived shortly after the dip and about half the way through my Midwestern Flight. I ordered the Slaw Burger, which is one of their fresh ground chuck patties, coleslaw, BBQ sauce, and their freshly-baked bun. Four-ounce patties at JL Beers give their burgers a distinctly different look and taste than other restaurants that sometimes use eight-ounce patties. You can taste the patty, but it isn’t the only thing you bite into. Smaller patties leave room for extra toppings and sauces that would normally be overpowered by a larger burger. You can add a fried egg and order the Humpty Dumpty,11 you can add some peppers and provolone cheese to make it a Philly cheeseburger. Options for your meal flow as freely as the tap beer choices at this establishment. Atmosphere 4 / 5 Quaint is the polite way of saying this place is…well, small. If your party is large, be prepared to do a lot of finagling of chairs or possibly not even sitting together. Take whatever seat you can get. With the fast-paced food and service, one can feel a tad bit rushed while trying to enjoy a meal or brews. If you want to sit and stay for a while, just be prepared to keep ordering. Also, the place is just fun. They have a thing called “beer mail” where you can write out a postcard, hand it to the server, they call out “Beer mail!” and they will send it to whomever you want. Service 5 / 5 From the moment I walked in, I was treated as though I was a regular. The staff attempts to help each person find a spot to sit, and if they can’t they ensure you they’ll get you a beer in no time. All the questions I had were answered graciously, and they don’t judge if you don’t know a lot about beer. They will take the time to help you find your perfect ale. FOOD 5 / 5 I couldn’t find one thing wrong with the food. It was spectacular. As I’m typing this I’m also Googling their phone number to put in an order for pick-up tonight for supper. Their burgers are creative, juicy, and are very reasonably priced. The portions of fries were a little smaller than normal, which can be a downer if you’re in the mood for some home-cooked fries. But at $2.39 for a side of fresh fries, you could always order two! The buns are toasted fluffy and warm, the burgers are crispy, and the toppings are not too heavy or too light. Amazing. I feel déjà vu typing that…didn’t I say that about pizza? Or bagels? I’m seeing a correlation between eating and “being American,” but being a food writer…. I’m okay with that. Woot Woot! Go downtown Sioux Falls!! If you haven’t been downtown lately, get your butts off 41st Street and check it out!! Don’t blink while you’re driving down Phillips Avenue or you might miss it! A certain establishment downtown asked a certain member of our community to leave said place because he wasn’t properly dressed…. they didn’t know that every other day of the week he wears suits. Woops! Don’t mind if I do. Then you actually lose track of your wait time! Either way, the bartenders don’t care…they are there to cook burgers and serve beer. They do encourage “community seating” where you share a table if you don’t fill it. It’s awkward the first couple minutes, and then you keep eating or drinking and forget. Don’t judge, I shared them with a friend. Be advised, the samples are quite large. If you’re going over lunch, make sure your boss is okay with you coming back with a slightly happier demeanor. Okay, now you can judge me. If you haven’t had an egg on your burger yet, you haven’t lived. As I was eating my burger, I realized “Shoop” was playing in the background…What activity wouldn’t be made better by a little Salt ‘n Pepa? That quote is attributed to “JL Beers” and is one of several witty quotes displayed (and for sale) on t-shirts at JL Beers and Great American Burgers, which opened in April on the 300 block of South Phillips Avenue. The North Dakota-based company got its start in Fargo back in 2009 and by October 2010, JL Beers was named “best burger joint in North Dakota” by USA Today. After expanding into West Fargo, Moorhead and Grand Forks, the ownership group looked south. The décor of the place certainly fits the unique and trendy feel of many downtown shops, bars and eateries. The painted brick wall just inside the door sports their motto, “Seating for 1000 – 47 at a time.” JL Beers encourages community seating to help customers to get to know one another as well as enhance the speed to getting one of the 47 chairs. Tall black tables and metallic silver chairs, ductwork overhead and “industrial art” on the wall are just a few of the unique features inside JL Beers. Be sure to check out the paper towel spools on each table that feature handles of different beer taps. You can also sit at the long bar counter to view the selection of bottled beers on the shelves or the 40 taps currently being offered. The InFOAMation board behind the bar posts the current beer features. 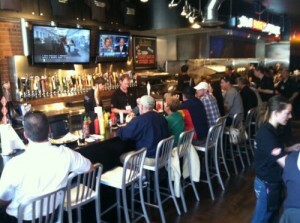 Sitting a little farther down the bar you can watch the JL Beers cooks making those fresh burgers, fries and chips. Perhaps the most interesting view is the table next to the window looking into the cooler where you can watch the next keg being tapped. JL Beers has their own brand of brews, and there are always at least two of their own beers on tap. While some tap beers may be standard offerings, most are changed out as soon as the keg is gone. “We want to give our customers a unique experience and let them have the chance to try a wide variety of beers,” says Wilson. “So, we may change anywhere from one to seven taps each week. Wilson says they produce a beer menu on a regular basis with the current lineup of tap beers, but that can easily be outdated by the time it’s printed. So, with beers changing almost daily, how can you keep track of what’s on tap? There’s an app for that! The JL Beers app for iPhone and Android will let you know the current offerings. You can search by JL Beers location, the beer’s origin or beer style – as well as rate the beers you try. For even faster updates, text JLBEERS323 to 46786. If you are enjoying the JL Beers experience, you can let your friends know by sending them Beer Mail. Write a message on a preprinted postcard inviting them to join you there the next time – and the staff will take care of the postage and drop it in the mail for you. The cold brews certainly get first mention in the establishment’s name, but the burgers deserve more than a passing mention. All of the burgers at JL Beers are made with fresh ground beef and served on a fresh baked bun. For basic burger lovers, you might prefer the Original Hamburger Stand Burger with pickles and special sauce or the Great American Burger with cheese, pickles and ketchup. JL Beers paid tribute to its new home city by adding a locally-named burger to its menu – the Phillips Ave. Burger with bacon, cheese, barbeque sauce and a hamburger patty with barbeque rub. Other more adventurous burgers are the BLT BLU®, Rajun Cajun and the Slaw Burger. Exclusive to JL Beers is their famous Humpty Dumpty Burger® with cheese and a fried egg. The fresh cut fries or chips are the perfect accompaniment for the burgers. You can get them with just classic sea salt or add a little zip with Cajun, Jalapeno Cheddar or BBQ Seasoning. For something extra, they offer a variety of dips like Cajun Lime, Ranch, BBQ Ranch, Chipotle and what they hail as the “Best Beer Cheese Dip Ever.” Another tasty option is to order the Buffalo BLU Fries or Chips…they are topped with buffalo sauce and blue cheese. No meal is complete without dessert, and JL Beers has that covered as well with its 1919 Root Beer Float, featuring the famous 1919 Root Beer (caffeine and gluten free) paired with Schwan’s creamy vanilla ice cream. One important note: you must be 21 to enter JL Beers. But, you can always get orders to go! It’s a little reminiscent of “Cheers” (of television sitcom fame). Now Sioux Falls has its own place where everybody knows your name. JL Beers: A good first impression. And a quirk. I’ll admit this place basically had me hooked with just their name. JL Beers? Forty beers on tap? Yes please! Add that it’s also known for it’s burgers and fresh-cut fries and is located only blocks from work in downtown Sioux Falls, and I had really high hopes this would become one of my favorite places in town. And while I never solidify an opinion after one visit, early indications are I’ll be visiting JL Beers often. As expected, the place was packed for lunch. Their website jokes they have seating for 1,000 people, 47 people at a time. Don’t doubt it. Both burgers were awesome, the fresh ground beef and buttered buns were, well, fresh. I ended up putting some Sriracha on both, and this was especially good on the egg burger. The fries were good, crisp and not greasy. Good as they were alone, they became addictive when the beer cheese dip was added. That stuff is for real. I want some more, right NOW, and I’m still totally full. I don’t know what the recipe is, but if that stuff was sold retail, I’m pretty sure my freezer would be filled with it in case they ran out of it or something and I needed a fix. For the tech geeks, they have an app for iPhone and Android that’ll let you know the beer lineup, search by style or popularity and rate the beers for other users. Pretty cool. One warning though: they do not have faucets installed to serve water. When I asked for water my server asked if bottled was okay. I said yes, knowing I would likely be charged for this. Yep; $1.50. Not a huge deal, but just so you know. Also, no water means no ice for your soda if you order that. You’ll get a can and a frosty glass, but no ice. Again, just FYI. JL Beers opened its first South Dakota location at 323 S. Phillips Ave. in downtown Sioux Falls today. The North Dakota-based company has 40 beers on tap as well as dozens of import bottles and 10 styles of burgers along with fresh-cut chips and fries. “This is our first one in South Dakota and we hope to do some more,” co-owner Warren Ackley said. Tom Bueling of Fargo was the first customer at the Sioux Falls location. “It’s just fantastic,” he said. Unique to this JL Beers location is a glass walk-in cooler where customers can watch a fresh keg of their favorite brew being tapped.